Type: Creeping Thistle is an herbaceous perennial weed with sharp, prickly leaves (sometimes with lilac-pink flowers) that emerges in early June and can infest landscapes throughout the U.S. through late October. 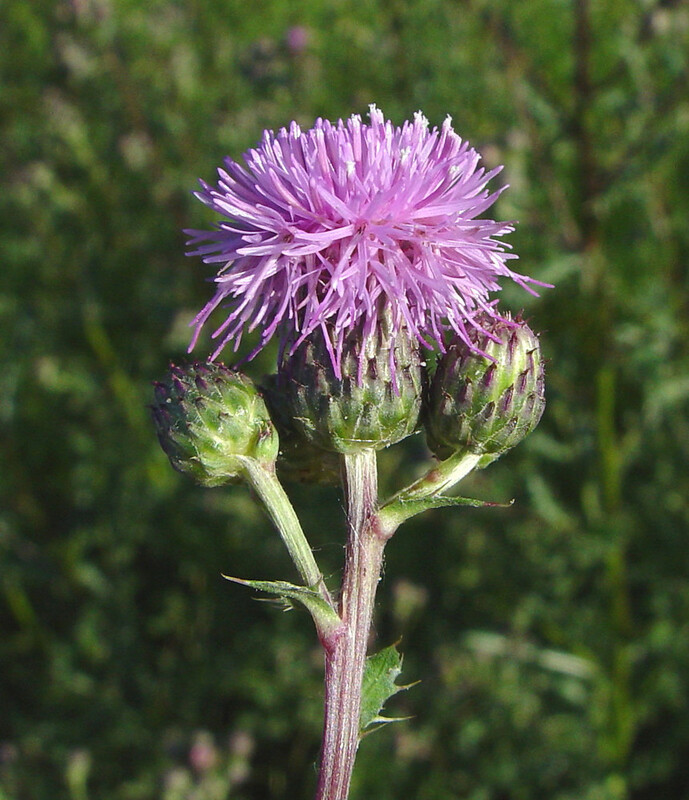 A member of the Asteraceae family of thistles, this weed can spread rapidly via its highly aggressive spreading root system, or its ability to scatter thousands of seeds in a short time. Where It Grows: Native to Europe and Asia, this weed has been widely introduced to most of the globe. In the eastern U.S., it dominates north of the Ohio River and the Mason-Dixson line (with exception to West Virginia, where it is has also become well-established). West of the Mississippi River, Creeping Thistle has spread across most of the United States with exception to the southern Great Plains. Creeping Thistle is the most common thistle species in the U.S. It prefers recently disturbed/cultivated grounds (such as vegetable gardens), road side and field edges, and other patches of relatively barren soil. Barren patches of turf provide an ideal germinating for wind-dispersed thistle seeds. The best defense against a creeping thistle invasion is a dense, well-established turf. How to Identify: Creeping Thistle consists of tiny pink/lilac florets which comprise a larger flower head. Each complete head sits atop a spiny bract (a circular arrangement of leaf-like tissues at the apex of the stem). Its slender green stem ranges anywhere from 30 to 150cm tall. Its spiny leaves alternate around the stem, topping out around 20cm in length. Regularly mowed turf is unlikely to see this weed in the flowering stage, however Creeping Thistle is notorious for its spiny leaves which can leave a painful prick. Growing Season: Creeping Thistle tends to emerge from the soil in early June, with its bright purple flowers dominating roadside landscapes by mid-July. When large stands of this weed begin to seed, the flower heads take on a dense cotton-like appearance. A burst of wind can send thousands of seeds into the air in a matter of seconds. Creeping Thistle continues growing and flowering through October. How To Manage: There are two ways to remove Creeping Thistle, hand removal or herbicide. You can hand remove Creeping Thistle from gardens or lawns using thick gloves to avoid their prickly leaves. However, since Creeping Thistle produces an extensive root network so you need to assure all roots have been successfully removed to avoid re-establishment (even traces of roots can lead to new thistle shoots). Each individual plant can send up multiple shoots, giving the appearance that there are many more individual plants than in reality. In addition, when removing by hand you want to avoid spreading the flower's light fluffy seeds. In order to prevent germination of thistle seeds, make sure any large thistle stands are removed before flowering. Creeping Thistle seeds can quickly be blown to other areas of your landscape and rapidly take over. Once removed, throw the weed away and do not try to compost them because traces of roots or seeds will quickly establish new plants. If herbicides are the preferred method of removing Creeping Thistle, apply when the weed is actively growing in the spring or early fall. You can use a broad-spectrum herbicide that will not damage trees or other ornamentals in a shared root zone (such as 2,4-D MCPA, Triclopyr or Dicamba) or a non-selective herbicide (glyphosate) when you can safely target the weed directly. In most cases, apply the herbicide in a heavier than normal concentration, as Creeping Thistle has a root network often larger than its above ground shoot mass and multiple treatments may be necessary. Once applied, DO NOT mow or cut back the thistle in any way; allow the herbicide to absorb into the shoot tissue so that it may be transported down to the roots. Prevention: Creeping Thistle typically thrives in low fertility soils so amending the soil and improving the environment for your preferred plants and turf can reduce its appearance. You can also avoid this weed by applying a pre-emergent herbicide/fertilizer application in the early spring that will prevent it, or any thistle species, from taking hold of your lawn throughout the season. Check out TurfCare's catalog of professional turf products to view the pre emergent or post emergent herbicides and soil amendments available.